Your competitor analysis framework should give your stakeholders an overview of how the playing field looks. A side-by-side comparison with top competitors helps teams strategize better, plan business growth and provide a clearer vision for the organization. When creating a competitive analysis, you should first consider defining the criteria for the comparison. Common high-level pieces are company information, description, products or services, strengths and weaknesses and market-fit. Create your Competitive Analysis now for free! These competitive analyses were made using Xtensio. 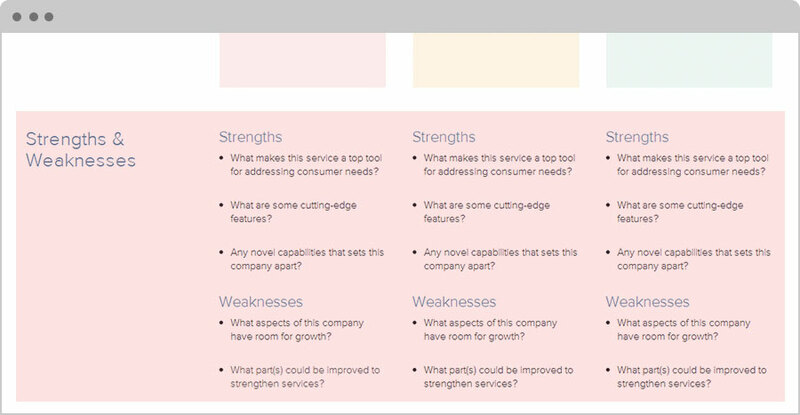 Below are tips and tricks for filling out the Competitive Analysis Template. Before you begin, we encourage you to define your target audience. Who will be examining this document? Internal team, stakeholders, potential investors, etc? Will they have consistent access to this document? Will this report be presented? Answering these questions first will help guide the language and content of your analysis. This is a basic format — do not feel as though you must stick to it. Our tools are here to provide you with a little inspiration and direction, not restrict you to a box. Do your research and ask more questions — you might find unique criteria where opportunities for your company reveal themselves. A company’s slogan, tagline, mission statement and unique value proposition — all of these are important when determining how you stack up against your competitors. What is the company’s key positioning and how does it compare with other companies in this space? How do they describe themselves? This section is your opportunity to include what you feel is valuable descriptive information. In 2017, it’s a requirement for any company to live on the internet. This section gives you and your team easy access to your competitors’ online presence. Include links to the social media channels and webpages your competition has the most activity on. By providing these links, your audience can quickly determine what channels the companies take advantage of the most and how they use them to tell their brand story. Understanding why and how the competition is doing well or not with their online presence will reveal the opportunity. 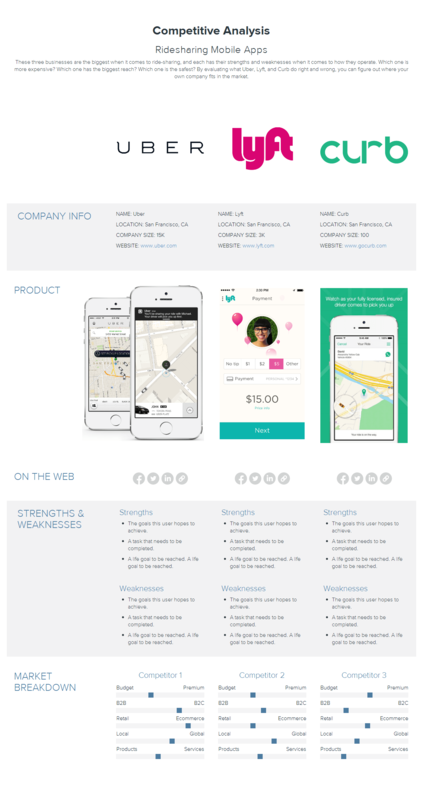 Whether it’s a food truck or mobile app, every business has a product or service to offer. Find an image that captures your competitor’s offering and upload it to the template. Again, social media will be a great resource for discovering imagery for this section. It’s easy to notice what your competition is doing wrong, but what about the things they’re doing right? In order to compete, you must dissect all aspects of your competition by completing a SWOT analysis. What are their customers happy about? What are they complaining about? Use this opportunity to dive into some qualitative competitor analysis. Go online and gather YouTube and Facebook comments, check out conversations on Twitter. If you can interact with your competitors’ customers face-to-face, go out and talk to them. You can use all of this information to your advantage. What’s each competitor’s position in respect to the market landscape criteria? Add new data pieces to compare across the board. This will help your audience understand the market and where your competitors stand in relation to one another. So there you have it, Xtensio’s Competitive Analysis Template. Remember this document is super flexible — you’re not bound to use any category the way we have it. Click inside text modules and type away, add new modules, graphs, charts, images, etc, drag & drop to reformat — whatever the case is, make something great. And if you’re working on a team, add your colleagues to join in the editing process with Xtensio’s collaboration feature. 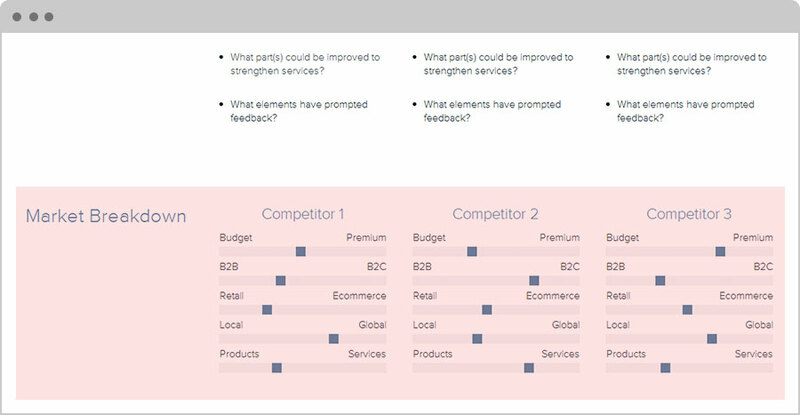 Bonus: After completing your Competitive Analysis, fill out the Business Model Canvas sample to re-evaluate your unique value proposition.